WHENEVER there is talk about genocides, many hurriedly think of the Jews Holocaust of 1933-1945. In Africa, people are reminded of the first 20th century genocide of 1904-1907 of the Herero and Namaqua people in Namibia and later the Rwandan civil war of 1994. However, Sven Lindqvist a Swedish author, in his book Exterminate All the Brutes, shows how the ideology that led to Hitler’s war and the Holocaust was supplied primarily by British theorists. He states that in 1799, Charles White began the process of identifying Europeans as inherently superior to other peoples. By 1850, the disgraced anatomist Robert Knox had developed the theme into fully-fledged racism. Knox in his book The Races of Man asserted that dark-skinned people were destined first to be enslaved and then annihilated by the “lighter races”. British theorists such as Winwood Reade, Alfred Russell Wallace, Herbert Spencer, Frederick Farrar, Francis Galton, Benjamin Kidd, even Charles Darwin saw the extermination of dark-skinned people as an inevitable law of nature. Some of them argued that Europeans had a duty to speed it up: both to save the integrity of the species and to put the ‘inferior races’ out of their misery. And the British being the authors; practised it at the heart of their ‘civilisation’ mission in Kenya. Britain first laid claim to Kenya when Africa was carved up by the imperialist powers in the 1880s. In contrast to Congo and South Africa, where the imperialists extracted enormous mineral wealth, British interest in Kenya was mainly strategic. To control access to the source of the Nile, the British built a railroad from Mombasa on the Indian Ocean coast to Lake Victoria in inland Kenya. In order to claim the farmlands of the Central Highlands, part of the Great Rift Valley, the British slaughtered Kikuyus by the thousands. By the end of the Second World War, 3 000 European settlers owned 43 000 square kilometres of the most fertile land, only 6 percent of which they cultivated. The African population of 5,25 million occupied, with ownership rights stripped, less than 135 000 square kilometres of the poorest land. Many indigenous Kenyans driven off their lands were pushed onto “native reserves” set up by the colonial regime in 1915. On the native reserves much of the land was unsuitable for agriculture. These reserves were separated by ethnic grouping as part of reinforcing divisions among the Kenyans. As the population in the Kikuyu reserves grew and more British settlers seized more arable land, subsistence became even more difficult. The landless and impoverished black population was subjected to a system of racist laws regulating land, as well as a poll tax and a hut tax. There were also pass laws (kipande) like those in Rhodesia, prohibiting free movement including in the search for employment. Access to education for the poorest was nil; a small privileged layer was able to attend schools run by Christian churches. Outside the reserves other displaced Kikuyu became squatters on the white settlers’ farms in conditions akin to serfdom. Although there were other ethnic groups among the squatter population, the Kikuyus were the most numerous and were subjected to special repressive measures. Pastoral groups such as the Kalenjin people, who included many police, and the Luo were regarded by the colonialists as potential allies and largely exempted from the anti-squatter measures. The British spent decades trying to keep the Kalenjin, the Luo and Kikuyu divided, fearing that if the three groups ever united, their combined power could bring down the colonial order. Kenya has forty-eight tribes, with the Kikuyu, the Kalenjin and the Luo together representing almost 60 percent of the population. The landless peasants revolted against colonial rule resulting in the Mau Mau uprising in 1952. To suppress the revolt, the British declared a terminal “State of Emergency” lasting from 1952 to 1960. The suppression involved barbarous and savage acts of torture, physical mutilation including castration and painful vaginal injuries, famine and disease, along with psychological torture designed to break the spirit while working on destroying the body. Under the State of Emergency the settlers, British Army and Home Guard were permitted to summarily execute anyone who failed to stop when ordered. Thousands of Kikuyu were shot on sight. 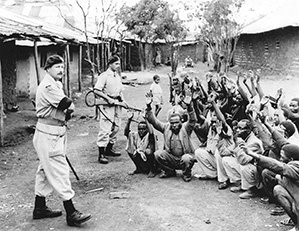 In late 1953 the British opened a new campaign, code named Operation Anvil, to cut off the supply network of the Mau Mau. The first target was Nairobi, which was believed to be the centre of their organisation. On April 24 1954, the police rounded up all the African inhabitants in the city, around 300 000 people. Of them, up to 130 000 men were taken to holding camps. The families of the arrested men were pushed into the already overcrowded native reserves. In rural areas Kikuyu women and children were forced into fortified villages, surrounded by spiked trenches, barbed wire and watch towers and were heavily patrolled by armed guards, something similar to our own protected villages during the liberation war. The women were routinely sexually assaulted and raped by British officers, sometimes mothers and daughters together in the same hut. The British claimed this policy, known as “villagisation”, was “purely protective and beneficial for the Africans”. It gave the colonial authorities total control over the Kikuyu. Between 1953 and 1956 more than 1 000 Africans were hanged for alleged Mau Mau crimes. Public hangings, which had been outlawed in Britain for over a century, were carried out in Kenya during the emergency. During the Emergency, virtually the entire population of one and a half million Kikuyu, the country’s largest ethnic group, were imprisoned in concentration camps. These concentration camps were not wholly different from those in Nazi Germany or in Namibia’s Shark Island. Tens of thousands of Kikuyu people were exterminated. British officials sliced off ears and fingers, gouged out eyes, mutilated women’s breasts with pliers, poured paraffin over people and set them alight. Large numbers of men were castrated with pliers. While others were raped, sometimes with the use of knives, broken bottles, rifle barrels and scorpions. Although the peasants were ultimately defeated, the uprising forced an end to colonial rule. Decades went by before the British agreed two years ago to pay compensation for this genocide. But no amount of money can erase Kenyans’ collective memory of such barbaric acts.